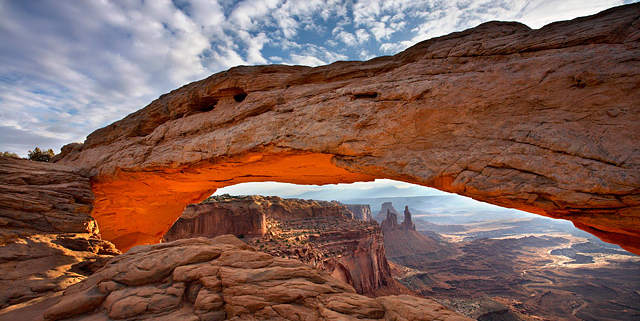 Tourists and geologists alike come from all over the world to see and study the magnificent exposures of geologic units displayed in Utah’s Colorado Plateau region. Of particular interest is the Grand Staircase, which is an immense sequence of sedimentary rock layers that stretches south from Bryce Canyon National Park and Grand Staircase–Escalante National Monument (GSENM) into Grand Canyon National Park. Some have compared these exposed rock layers to the pages of an open book which invite visitors to look back in time at the geologic history of the area. This is especially true on the edges of massive geologic folds such as the Kaibab uplift, which extends across much of the Grand Staircase area. Where the eastern edge of the Kaibab uplift crosses GSENM, normally flat-lying rock strata tilt abruptly to the east as part of a sharp fold known as the East Kaibab monocline. Erosion of the steeply tilted strata has formed a long, imposing ridge called The Cockscomb—named after the ridge’s resemblance to the colorful “comb” on a rooster’s head. The Cockscomb has a long geologic history that can be simplified into three phases. The oldest layers exposed at the base of this unique geologic feature were deposited between about 270 and 185 million years ago in the Permian to Early Jurassic periods. During this time, Utah was situated on the west coast of North America with much of present-day California and Nevada existing as offshore islands. Warm, shallow seas accumulated thick layers of siltstone and limestone which form the cap rock for much of the Kaibab uplift, but represent the lowest exposed layers of The Cockscomb. As North America drifted westward, Utah was uplifted above sea level, transitioning into a terrestrial environment of west-flowing rivers and streams that deposited thick layers of colorful sediments now exposed in the Vermilion and Chocolate Cliffs of The Cockscomb and Grand Staircase (seen best from Stop #1 on the map). Beginning sometime after 200 million years ago, the rivers, lakes, and streams of the previous phase began to dry out as the climate in Utah transitioned to that of a desert. In this second phase of the region’s evolution, sediments deposited by the older river systems were blown into sweeping dune fields up to thousands of feet thick. These dune fields were inundated by a shallow, narrow seaway that provided minerals to cement the sand deposits now known as the Navajo and Sandstones, which form the impressive White Cliffs of the Grand Staircase and The Cockscomb (best seen from Stop #2 on the map). Other deposits associated with these shallow seas include interbedded limestone, siltstone, and mudstone of the late Jurassic period. By the beginning of the third phase, in Early Cretaceous time about 145 to 79 million years ago, regional drainage became completely reversed from that of the first phase. Instead of rivers draining westward into the Pacific Ocean, they now drained eastward into a large sea that covered most of eastern Utah and Colorado. Sea level fluctuations in this Cretaceous seaway left thick, alternating layers of sand, mud, and silt. These more dull-colored deposits make up The Cockscomb’s iconic layers such as the Dakota Sandstone, Tropic Shale, and Straight Cliffs Formation. 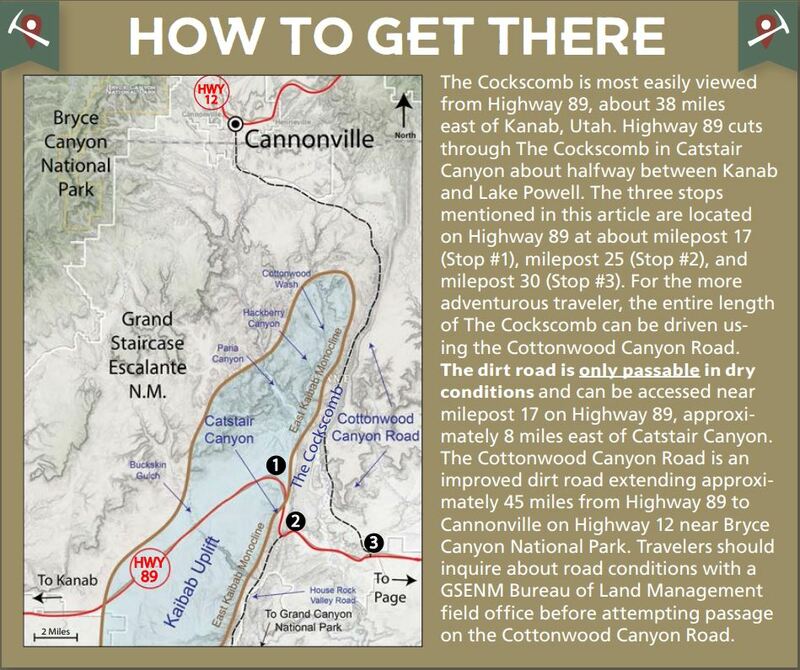 These units form the Gray Cliffs and Straight Cliffs of the Grand Staircase and can be seen from Stop #3 on the map or along the east side of the Cottonwood Canyon Road. During the end of the Cretaceous period, the Kaibab uplift and East Kaibab monocline began to take shape due to compressive forces affecting western North America. As this massive fold rose and was eroded by tributaries of the Colorado River, the scenic features of the Grand Staircase such as The Cockscomb and Bryce Canyon and the Grand Canyon began to form along its tilting periphery. 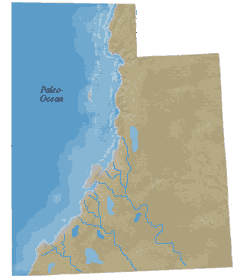 Geologists are not completely sure when the Colorado River drainage took its present shape, but most agree that sometime in the past 65 million years (and possibly as recently as 6 million years ago) rivers started to cut their way across the Kaibab uplift, eventually finding their current outlet into the Gulf of California. Small Colorado River tributaries which slice their way across the seemingly impenetrable cliffs of The Cockscomb include Cottonwood Wash, Hackberry Canyon, Paria Canyon, Catstair Canyon, and Buckskin Gulch. These drainages originate near Bryce Canyon National Park and flow southeast across the northern reaches of the Kaibab uplift, only to join the Colorado River and then turn and recross the southern part of the Kaibab uplift in the Grand Canyon! How these rivers were able to cut their way through the uplift is a subject geologists have been debating for many years. Do the rivers predate the East Kaibab monocline? Did the rivers erode through the uplift after it was fully formed? Either way, these drainages provide important clues to geologists as they attempt to reconstruct the sequence of events that formed the present topography. And The Cockscomb, as an eastern expression of the Kaibab uplift, will continue to attract visitors and geologists from around the world as they not only enjoy its beauty, but use the feature to study the geologic processes that shaped the Grand Staircase. he lid and shake it. Although technically not true geysers, these cold-water eruptions look so much like hot-water geysers that they are referred to as “soda pop geysers.” In Utah, the largest of these is Crystal Geyser. Crystal Geyser is a partially human-made geyser located on the shore of the Green River, approximately 10 miles south of the town of Green River, Utah. The geyser originated in 1936 when an oil exploration well tapped into a groundwater system under immense pressure caused by a reservoir of trapped carbon dioxide (CO2) gas. However, the high-pressure system that the well penetrated had previously created a series of ancient natural springs and tufa deposits which were first referenced by John Wesley Powell in 1869. On his way down from the present town site of Green River and the state park museum which now bears his name, he wrote, “an hour later, we run a long rapid, and stop at its foot to examine some curious rocks, deposited by mineral springs that at one time must have existed here, but are no longer flowing” (Powell, 1875, Report on the Exploration of the Colorado River of the West and Its Tributaries, p. 51–52). Perhaps because of a geologic investigation published in 1914 that reported a series of oil seeps in the area, an exploratory oil well, the Ruby No. 1, was drilled in 1935 on the margin of the ancient spring deposits. In November of that year, a Moab newspaper reported on the progress of the well stating that a significant flow of water had been encountered at a depth of 44 feet. By January 1936, the newspaper reported that drillers had encountered CO2 gas at a depth of 360 feet at high enough pressures to shoot 105 pounds of drilling mud 60 feet into the air. The well was abandoned after drilling to a total depth of 2627 feet, but in its aftermath, a geyser was created that quickly became a regional attraction. 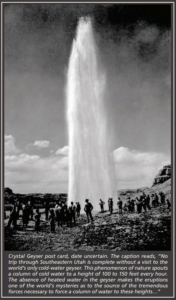 The November 1936 front page of Moab’s Times-Independent boasted of a new geyser that spouted an 80-foot column of water at regular intervals of about 15 minutes and a 150-foot column at intervals of about 9 hours. The pressurized CO2 gas that drives Crystal Geyser is likely derived from rocks close in age to those that have produced much of the oil and natural gas in the adjoining Paradox Basin of southeastern Utah—an ancient sedimentary basin containing oil-producing shale and evaporite rocks deposited more than 250 million years ago. The gas migrated upward into the Jurassic-age Navajo and Entrada Sandstones, where it became trapped and pressurized. The Little Grand Wash fault, which runs in an east-west direction adjacent to Crystal Geyser, served as a barrier to the upward migration of gas in these geologic units, trapping it in an underground reservoir of permeable rock. Weakness in the fault also served as a conduit for fluids in this pressurized system to leak upward, creating carbonate-rich springs and oil seeps which early geologists reported in the immediate vicinity. When the 1935 oil exploration company penetrated the cap on this gas reservoir, water from higher geologic units flowed down the hole to meet gas escaping from lower geologic units. The mixture of the gas and water continues between eruptions until a CO2 saturation point is reached. As soon as the water becomes oversaturated, the CO2 violently bursts out of solution and forcefully ejects the water from the borehole. Holes in the casing of the well allow much of the ejected water to flow back down the well and the whole process begins again. Crystal Geyser is not the only CO2-driven geyser in this region of Utah. The same type of gas deposits in the northern Paradox Basin are responsible for several nearby springs and smaller but similar geysers around the town of Green River and Woodside. Other cold-water CO2 geysers are known in California, Germany, France, Serbia, Slovakia, and New Zealand. At its highest historically documented eruption of around 200 feet, Crystal Geyser is certainly one of the largest in the world. In recent years, Crystal Geyser appears to be decreasing in both its height and reliable frequency of eruptions. Much of this was likely caused by visitors dropping rocks down the borehole, creating a significant plug less than 50 feet down. Plans to clear the major obstructions have never materialized. Plans have also been made, but never carried out, to pressure cap the geyser in a way that might increase the frequency or reliability of the eruptions. Because major eruptions can often be more than 24 hours apart, and can often occur in the middle of the night, seeing them can be a difficult task and major time commitment. Studies carried out over the past two decades have used sensors to map the exact frequency and height of eruptions. These studies found that minor eruptions were somewhat unpredictable and ranged in height from 2 to 10 feet. Major eruptions attained heights of 40 to 80 feet and occurred on a schedule ranging from 17 to 27 hours apart. Eruption durations ranged from 3 to 49 minutes. Crystal Geyser is a unique geologic feature that has fascinated tourists for decades. For those willing to wait around for its eruptions, Crystal Geyser can provide the unique experience of watching or even playing in one of the world’s few large cold-water geysers. Access Crystal Geyser from I-70 exit 164, at the east end of the town of Green River, Utah. 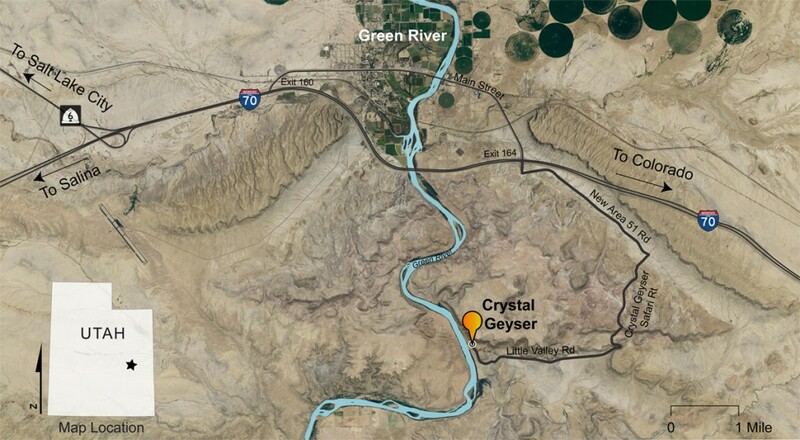 From there, head east for 2.4 miles on the frontage “New Area 51 Road” to the junction with “Crystal Geyser Safari Route.” Follow this well-graded dirt road south then west for 4 miles until arriving at a parking lot adjacent to both Crystal Geyser and the Green River boat access. Warning: Roads may be impassable in wet weather or winter conditions. Although the geology of the Zion National Park includes nine known exposed formations, all visible in Zion National Park in the U.S. state of Utah, Zion is predominately the result of one spectacular unit, the Navajo Sandstone. Zion’s formations represent about 150 million years of mostly Mesozoic-aged sedimentation in that part of North America. Part of a super-sequence of rock units called the Grand Staircase, the time exposed in the Zion and Kolob area were deposited in several different environments that range from the warm shallow seas of the Kaibab and Moenkopi formations, streams and lakes of the Chinle, Moenave, and Kayenta formations to the large deserts of the Navajo and Temple Cap formations and dry near shore environments of the Carmel Formation. Subsequent uplift of the Colorado Plateau slowly raised these formations much higher than where they were deposited. This steepened the stream gradient of the ancestral rivers and other streams on the plateau. The faster-moving streams took advantage of uplift-created joints in the rocks to remove all Cenozoic-aged formations and cut gorges into the plateaus. Zion Canyon was cut by the North Fork of the Virgin River in this way. Lava flows and cinder cones covered parts of the area during the later part of this process. Zion National Park includes an elevated plateau that consists of sedimentary formations that dip very gently to the east. 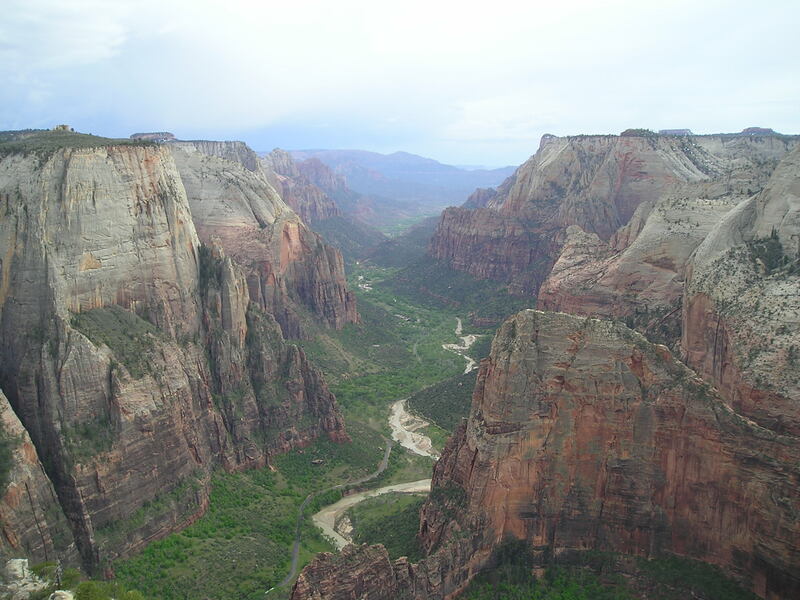 This means that the oldest strata are exposed along the Virgin River in the Zion Canyon part of the park, and the youngest are exposed in the Kolob Canyons section. The plateau is bounded on the east by the Sevier Fault Zone, and on the west by the Hurricane Fault Zone. Weathering and erosion along north-trending faults and fractures influence the formation of landscape features, such as canyons, in this region. Approximately 190 to 136 million years ago in the Jurassic the Colorado Plateau area’s climate increasingly became arid until 150,000 square miles (388,000 km²) of western North America became a huge desert, not unlike the modern Sahara. For perhaps 10 million years sometime around 175 million years ago sand dunes accumulated, reaching their greatest thickness in the Zion Canyon area; about 2,200 feet (670 m) at the Temple of Sinawava in Zion Canyon. Most of the sand, made of 98% translucent, rounded-grain quartz, was transported from coastal sand dunes to the west, in what is now central Nevada. Today the Navajo Sandstone is a geographically widespread, pale tan to red cliff and monolith former with very obvious sand dune cross-bedding patterns . Typically the lower part of this remarkably homogeneous formation is reddish from iron oxide that percolated from the overlaying iron-rich Temple Cap formation while the upper part of the formation is a pale tan to nearly white color. The other component of the Navajo’s weak cement matrix is calcium carbonate, but the resulting sandstone is friable (crumbles easily) and very porous. Cross-bedding is especially evident in the eastern part of the park where Jurassic wind directions changed often. The crosshatched appearance of Checkerboard Mesa is a good example . Springs, such as Weeping Rock, form in canyon walls made of the porous Navajo Sandstone when water hits and is channeled by the underlying non-porous Kayenta Formation. The principal aquifer in the region is contained in Navajo Sandstone. Navajo is the most prominent formation exposed in Zion Canyon with the highest exposures being West Temple and Checkerboard Mesa. The monoliths in the sides of Zion Canyon are among the tallest sandstone cliffs in the world. The Temple cap formation is the thin redish sandstone unit which caps many of the major spires in Zion National Park. Utah and western Colorado were deformed as the rate of subduction off the west coast increased in the Middle Jurassic Sevier Orogeny. At the same time, an inland sea began to encroach on the continent from the north. Broad tidal flats and streams carrying iron oxide-rich mud formed on the margins of the shallow sea to the west, creating the Sinawava member of the Temple Cap Formation. Flat-bedded sandstones, siltstones, and limestones filled depressions left in the underlying eroded strata. 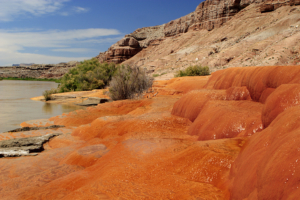 Streams eroded the poorly cemented Navajo Sandstone, and water caused the sand to slump. Although the units that form Zion are ancient in geologic terms. It’s erosion and canyon formation is fairly recent. Stream downcutting continued along with canyon-forming processes such as mass wasting; sediment-rich and abrasive flood stage waters would undermine cliffs until vertical slabs of rock sheared away. This process continues to be especially efficient with the vertically jointed Navajo Sandstone. All erosion types took advantage of preexisting weaknesses in the rock such as rock type, amount of lithification, and the presence of cracks or joints in the rock. Basalt flows concentrated in valleys but subsequent erosion removed sedimentary rock that once stood at higher elevations. The resulting inverted relief consists of ridges capped by basalt which are separated by adjacent drainages. In all about 6,000 feet (1,800 m) of sediment were removed from atop the youngest exposed formation in the park (the Late Cretaceous-aged Dakota Sandstone). The Virgin River carved out 1,300 feet (400 m) of sediment in about 1 million years. This is a very high rate of downcutting, about the same rate as occurred in Grand Canyon during its most rapid period of erosion. About 1 million years ago, Zion Canyon was only about half as deep as it is today in the vicinity of Zion Lodge.Assuming that erosion was fairly constant over the past 2 million years, then the upper half of Zion Canyon was carved between about 1 and 2 million years ago and only the upper half of the Great White Throne was exposed 1 million years ago and The Narrows were yet to form. Downcutting and canyon widening continue today as the process of erosion continues to try to reduce the topography to sea level. In 1998 a flash flood temporarily increased the Virgin River’s flow rate from 200 to 4,500 ft³/s (6 to 125 m³/s). Geologists estimate that the Virgin River can cut another thousand feet (300 m) before it loses the ability to transport sediment to the Colorado River to the south. However, additional uplift will probably increase this figure. The Narrows is the narrowest section of Zion Canyon. It is an 18 mile gorge or canyon filled by the Virgin River just upstream from the part of Zion where the roads and trails end. This gorge, with walls a thousand feet tall and the river sometimes just twenty to thirty feet wide, is one of the most popular areas in Zion National Park. You can see the bottom section of the Narrows by hiking along the paved, wheelchair accessible Riverside Walk for one mile from the Temple of Sinawava. If you wish to see more, you will be walking in the Virgin River. Travel upstream in the Virgin River Narrows is allowed for the first 5 miles (until Big Spring) at which point travel is restricted to down canyon, permitted travelers only. How far is the Virgin River Narrows Hike top to bottom? Most resources out there (including the Park Service brochure) like to say the Virgin River Narrows is a 16 mile hike from top to bottom. It is not! This number is based on old information, back when hikers used to be able to start at the end of the dirt road at Chamberlain Ranch. This is now against the rules, and hikers must start two miles sooner at the toilet facilities and parking lot above Chamberlain Ranch. A sign is posted saying “authorized vehicles only”, which forces hikers to hike the two mile dirt road making the entire hike from parking lot to parking lot 18 miles. download a pdf printable version of the map here. coming soon. Why Big Springs exists. What makes all the springs in the wallstreet section. Kolob Creek. Joint Systems. How can I hike The Narrows? A hike through The Narrows requires hiking in the Virgin River. You must get your feet wet since there is no trail. Most people choose to start their hike from the Temple of Sinawava via the Riverside Walk and then walk upstream before turning around and hiking back down to the Temple of Sinawava. Hiking in The Narrows upstream as far as Big Spring does not require a permit. Doing the hike this way allows you to see some of the most spectacular and narrowest parts of the canyon. You can hike in the river for an hour and have a great experience, or you can hike as far as Big Spring, a strenuous, ten-mile round trip, all-day adventure. You can also hike sixteen miles downstream over one or two days, entering the park soon after starting the hike and then exiting at the Temple of Sinawava. Those who choose this option must get a permit and arrange transportation for the one and a half hour ride to start the hike outside the park at Chamberlain’s Ranch. The Narrows are susceptible to flash flooding because much of the surrounding area is bare rock that does not absorb water. During storms, runoff is funneled rapidly into the Narrows. During a flash flood the water level rises almost instantly–within seconds or minutes. Flash floods are common in Zion and hikers have been stranded, injured, and even killed by venturing into narrow, flood prone canyons. Always check the weather forecast and the flash flood potential before you start your trip. Despite the forecast, flooding is possible at any time, and floods have occurred on days they were not expected. Your safety is your responsibility. Hiking in the river is strenuous. The water is often murky and the bottom of the river is covered with rocks about the size of bowling balls. This makes proper footwear and bringing in trekking poles or a walking stick essential. The Narrows may be closed in the spring due to flooding while the snow melts off the upland areas to the north if the flow rate is higher than 120 cubic feet per second (3.4 m3/s). Thunderstorms can cause The Narrows to flash flood during the summer. Rain showers upriver can cause flash floods in the canyon without it raining over the canyon itself. Thus, hikers should exercise caution when hiking The Narrows during rainy periods as the winding canyon and sheer walls make approaching flash floods all the more sudden and difficult to evade. Perhaps because it is covered in detail in Grade School and Middle School curriculum, one of the most asked geologic questions I hear from youth has to do with differentiating between the three types of volcanoes. The three main types of volcanoes differ in shape, size, and make-up; the differences partly result from the different types of eruptions. In the State of Utah there are many examples of the three main types of volcanoes. The following is a brief introduction to Utah’s volcanoes; only several of numerous volcanoes are mentioned. Stratovolcanoes erupted in western Utah between about 40 to 25 million years ago. At this time, Utah was closer to a continental-oceanic plate boundary where an oceanic plate (Farallon) was subducting underneath the North American continental plate. Stratovolcanoes are found at these types of plate boundaries. Today’s active stratovolcanoes include those in the Cascade Range in Washington, Oregon, and California where an oceanic plate (Juan de Fuca) is subducting underneath the North American continental plate. Two examples of Utah’s most recent stratovolcanoes are Mount Belknap in the Tushar Mountains and Monroe Peak on the Sevier Plateau. These stratovolcanoes exists on the tail end of a line of explosive volcanism that extended from near Richfield, southwestward to the Nevada border. Like ancient Yellowstone National Park, many of these volcanoes were among the largest volcanoes to ever erupt in North America. Because these volcanoes are old and have been extensively eroded, it is difficult to distinguish the original volcano shapes. The Mount Saint Helens eruption in 1980, is one of the best known examples of a strato-volcano in the U.S. Utah has a long history of similar type volcanoes. Shield volcanoes and cinder cones started to erupt about 12 million years ago after plate motions and resulting crustal forces changed. Compressional forces had eased, and the crust started to stretch between the Wasatch Range in Utah and the Sierra Nevada Range in California. This extension created splintered zones in the Earth’s crust where magma rose to the surface creating shield volcanoes and cinder cones. These types of volcanoes are far less explosive than stratovolcanoes and tend to create smaller deposits. Because the lava from shield volcanoes comes from a deeper source and contains more iron and less silica than stratovolcanoes, they tend to leave darker and thinner magma deposits. The most recent volcanic activity in Utah occurred about 600 years ago in the Black Rock Desert (Millard County). The only place in the United States were these types of volcanoes are currently active is Hawaii. Iceland and Hawaii are great modern examples of the shield volcanoes which have periodically erupted in Utah over the last 15 million years. Volcano – a vent (opening) at the Earth’s crust through which magma (molten rock) and associated gases erupt. Magma – molten rock beneath the surface of the Earth. Lava – magma that has reached the surface. Cinders – lava fragments about 1 centimeter in diameter. Pyroclastics (“fire fragments”) – ash, cinders, angular blocks, and rounded bombs (block and bomb fragments can be over 1 meter in diameter). Explosive eruptions – eject lava and pyroclastics. Quiet eruptions – fluid lava flows out of a volcano’s vent. Use this map to zoom in and explore Utah’s various volcanic deposits. Each element can be clicked for more details. The top arrow opens a Legend which explains the meaning of the maps various features. Why Are There So Many Arches in Utah? 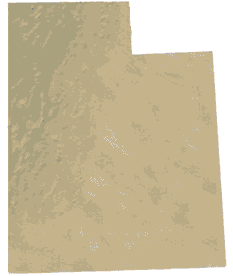 https://utahgeology.com/wp-content/uploads/2015/04/mesa-arch.jpg 360 640 Lance /wp-content/uploads/2018/11/utah-geology-logo4-300x73.png Lance2015-04-28 14:38:142018-11-14 05:18:59Why Are There So Many Arches in Utah? Keeper potholes are found in slot canyons. In the recent decades “slot” canyoneering has become a major sport, and very few areas of the world have nearly the number or diversity of slot canyons as southern Utah. People come from all over the world to descend slot canyons of varying difficulty in places such as Zion National Park, Grand Staircase–Escalante National Monument, Capitol Reef National Park, the San Rafael Swell, and Glen Canyon National Recreation Area. Nestled in the northwestern corner of Kane County is a geologically unique feature that receives relatively few visitors. Although most people in Utah have seen caves and waterfalls, it is peculiar for a waterfall to emerge from a cave system. Cascade Falls does just that, as an underground river emerges from a deep cave system and cascades down a steep cliff face. If you would like to contact me, drop me a line from the contact page. Or if you have questions about geology, call me during normal work hours at the Utah Geological Survey.